Making this recipe for White Chocolate Peppermint Christmas Bark will be your new Christmas tradition. It’s a super simple recipe to make, and with the yummy combination of chocolate and peppermint, it will be a hit with everyone who tries it! 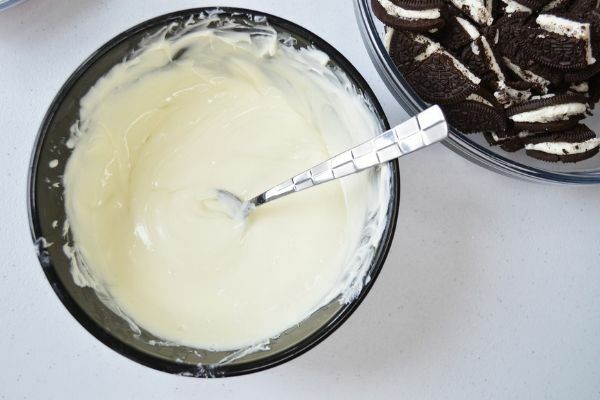 With all the busyness of the holiday season, it’s so nice to have a quick and easy treat that you can make that doesn’t take up the whole afternoon. Christmas bark is one of those kinds of recipes. It only take a few ingredients and comes together quickly. If you’ve never made Christmas Bark before, you’ll be surprised at how fast and easy it is. You can make it with white, milk, or dark chocolate, and add pretty much anything to it to make a fun candy. This white chocolate bark has chopped Oreo cookies and crushed peppermints or candy canes mixed into the chocolate, which makes for a great flavor. Christmas Bark is always popular at holiday parties or potlucks, plus, it makes a great gift for neighbors, teachers or co-workers…just put some on a pretty plate, wrap in clear cellophane and add a ribbon, and you have a festive gift. Red and white peppermint candies or Candy Canes. 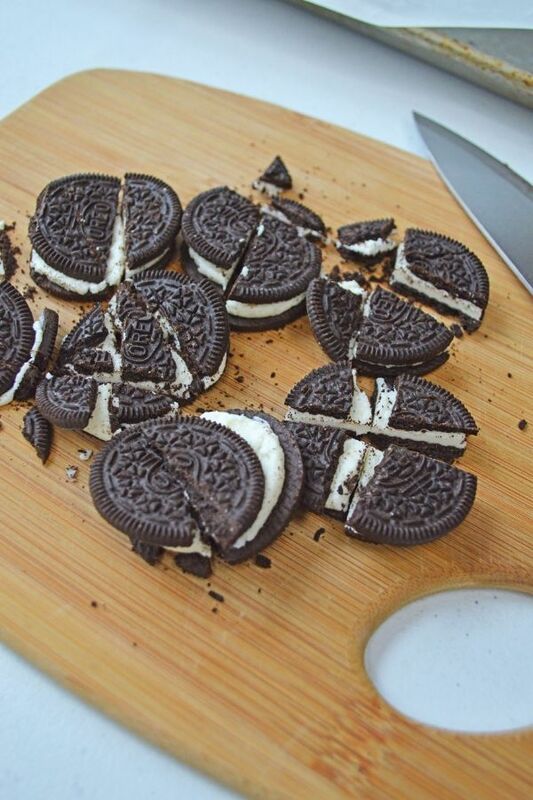 First, you’ll want to chop the Oreo cookies into big chunks with a knife. You’ll want them big enough that they are visible inside the bark, but small enough to fit into a bite-sized piece. Next, melt half of your white chocolate chips in the microwave, using a microwave-safe bowl. You want to heat the white chocolate in 30-second increments, making sure to stir well between each one. This took about 3, 30-second intervals in my microwave. Chocolate can burn quickly and easily in the microwave, so make sure to keep an eye on it. Spread out the melted white chocolate onto a piece of parchment paper-lined sheet pan or cookie sheet. Sprinkle the chopped cookies evenly over the chocolate in a single layer. Melt the rest of the white chocolate in the microwave, again making sure to stir after each 30 second intervals to make sure it doesn’t scorch. While the chocolate is still wet, sprinkle the crushed peppermints over top of the bark. Put the sheet pan into the refrigerator for about 2 hours, or until the chocolate is set. Then break the bark into 3-inch pieces, and set out for everyone to enjoy! 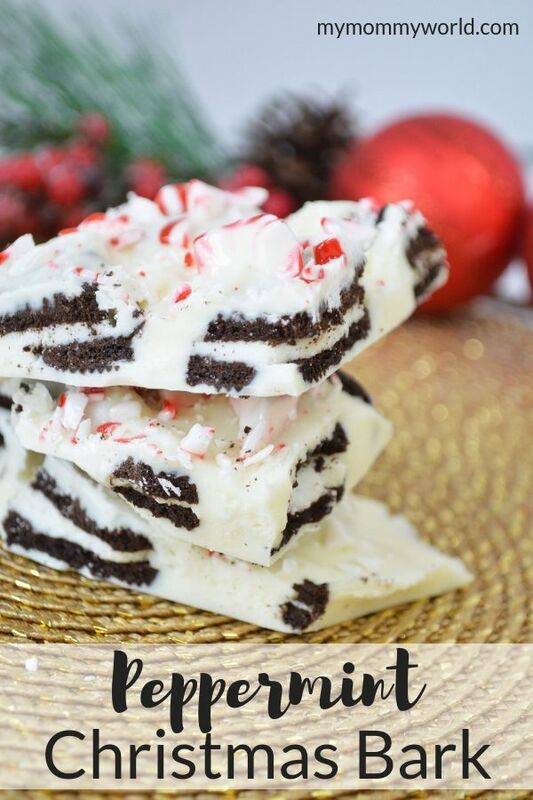 This White Chocolate Peppermint Bark recipe is not only a tasty holiday treat, but also makes a great Christmas gift too! Made with Oreo cookies, white chocolate and crushed peppermints, it is a very easy candy to make to celebrate the season. Refrigerate at least 2 hours, until chocolate is set. Break the bark into 3 inch pieces. This is a beautiful bark for the Christmas Season! Hope you have a great week and thanks so much for sharing this awesome post with us at Full Plate Thursday! This is one of my all time favorite holiday treats! Made some with my girlfriend a couple of weeks ago but we never thought to add Oreo to it. Needless to say, it looks like we’re going to be going back to the store today hahaha. Hi James…thanks so much for stopping by! We love making bark at Christmas and this looks like an easy and delicious one. We are going to give it a try. Yum!